Dullock Excavating LLC has been serving the local community since 2002 and is owned and operated by Dan and Heather Dullock. 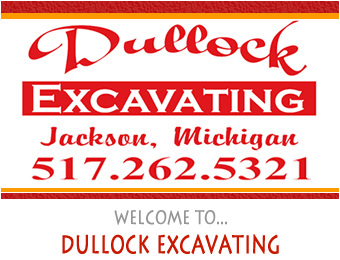 At Dullock Excavating we have the experience and equipment to handle your upcoming construction projects. Our services include areas such as drainfields, sewer/septic hookups, new construction, basements, finish grading, site prep, demolition, concrete/asphalt removal, stump removal, topsoil/gravel/crushed concrete, and more! To view services offered and photos of our work, visit our Services page. Our mission is to exceed the expectations of our valued customers with affordable prices and work done with integrity. The greatest compliment we can receive is a referral to your family and friends. We are licensed and insured and we look forward to working with you! Give us a call or request a free quote on your project today! and depend on Dullock Excavating!